Gerald Hamill & Sons Ltd in Portadown has been synonymous with the scrap metal industry since 1949. The family-run business is a leading processor and exporter of scrap metals, both ferrous and non-ferrous. Operating from a fully licensed four-acre waste management site, the company buys in all ferrous and non-ferrous metals at the best prices available. It has specialised in the removal and processing of scrap metal since the late Gerald Hamill started the business from humble beginnings 67 years ago. Ferrous metal is metal from iron and steel. This includes household products, redundant farm machinery, garage scrap, construction scrap, redundant plant and machinery, and factory steel. Non-ferrous metal is anything other than iron and steel, e.g. cooper, lead, brass and aluminium. The processed scrap metal is exported in baled and pallet form to customers in England who demand a top quality and professional service. “We pride ourselves in being a long-established family business, our commitment to customer service and being able to offer the most competitive prices for scrap metal,” explains general manager Peter McCluskey, who is a grandson of the company’s founder. Since Gerald Hamill’s passing in 1990, the company has continued to expand and prosper under the guidance of his son Maurice. 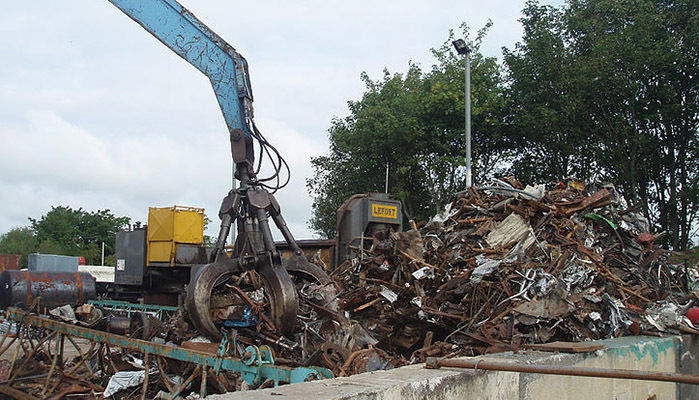 The recycling plant in Portadown receives scrap metal from customers in counties Armagh, Down, Tyrone and Monaghan, while scrap is also collected from local factories and manufacturing plants where roll-on, roll-off systems are in operation. There are separate weighbridges on site for ferrous and non-ferrous metals. Here, trained staff will assist you in grading, unloading and correctly weighing your scrap metal before payment is received. The Portadown facility is equipped to handle and process all scrap materials. Among the equipment used to separate and handle the scrap during the recycling process are Fuchs and Liebherr scrap handlers and a Hitachi excavator with shear grab. In addition, there are two trucks – a Volvo FH12 and a Volvo FL6 with hiab crane – on the road full-time. The export side of things is looked after by local company Anfield Transport, which provides a regular cross-channel service to Britain. Anfield Transport runs a selection of curtain-side, flat and extendable trailers as well as low loaders. Founded in 1979, it also has facilities in Liverpool and Birmingham to accommodate its part load and groupage operation. Gerald Hamill & Sons is fully compliant with all environmental regulations and holds waste management and waste carriers licenses. 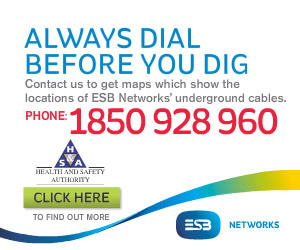 It is licenced by the Northern Ireland Environment Agency (NIEA) for all scrap materials with the exception of End of Life Vehicle (ELV), refrigerators, gas bottles and beer kegs. All hazardous waste is removed from the site in compliance with EU regulations. Whatever the legislation, the Hamill team has always complied with it. The company has invested heavily in state-of-the-art technology to ensure supply of high quality ferrous and non-ferrous materials, and to precise customer specification. The staff at Gerald Hamill & Sons is highly experienced and offers the highest standards of services to customers, contributing to its reputation as a leader in its field. The Co. Armagh-based concern also specialises in machinery installation and removals. It has a range of forklifts and lifting equipment to assist your with the installation or removal of a heavy industrial machine into or out of your factory. “Maurice is an engineer by profession but he’s also a dab hand with forklifts. He’s a range of forklifts and lifting devices from a one-tonne Mitsubishi to a 25-tonne Kalmar. He can look after all your lifting requirements at a reasonable price,” Peter says. Gerald Hamill & Sons has new and second hand steel for sale at all times, including Box Section, H Iron, Channel Iron, Angle Iron and Steel Plate. Also for sale are miscellaneous machines, equipment and tools. If you have any scrap metal for sale, Maurice and his staff would be delighted to hear from you and offer you a competitive price for it. The concreted yard in Portadown is open from 8am to 6pm Monday-Friday and from 8am to 4pm on Saturdays. “The price of scrap metal isn’t as good as it was four or five years ago, but you’ll always have your peaks and troughs in this business. Our customers can still be assured of the best prices available,” Peter concludes.